The mosquito-catching efficacy of 10 different mosquito trap designs was compared in a study in tropical Far North Queensland. The Mega-Catch™ ‘Premier’ was the most effective mosquito trap, followed by a Mega-Catch™ experimental prototype the 'Alpha' and the Mosquito Magnet ‘Defender’. Despite the absence of any carbon-dioxide attractant, the Mega-Catch™ ‘Premier’ was far more efficacious than most traps that used carbon-dioxide. Statistical analysis revealed that this trap performed significantly better than seven other designs. 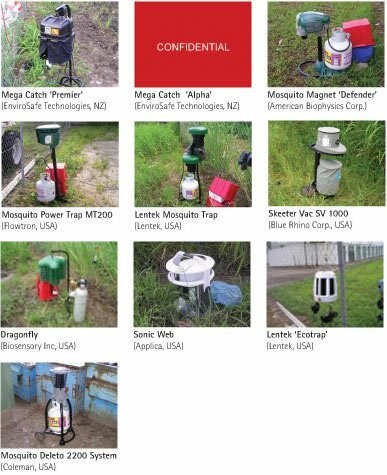 A wide variety of mosquito traps are available to public consumers, particularly in the USA, where emerging fatal mosquito-borne illnesses stimulate the market for such devices. However, there are few scientifically sound comparisons between available traps. In this study, the mosquito catching ability of a series of commercially available mosquito traps was assessed. The study was conducted during late summer 2004 at the Cairns City Council Waste Transfer Facility in Smithfield, a suburb of Cairns. The study site was an open, grassed area featuring large mounds of garden and tree waste, other solid waste (e.g. disposed whitegoods, recyclable containers) and two creeks with little or no littoral vegetation. The site was immediately bordered to the east by a Melaleuca forest adjacent to mangroves. Almost all mosquitoes captured in the study are probably from this adjacent forest and marsh. Figure 1. The 10 trap types compared in this study. The traps (Figure 1) were operated according to the manufacturer's instructions, utilizing octenol lures supplied with the traps when applicable. They were rotated randomly through 12 sites over 12 nights (from approximately one hour prior to sunset until approximately one hour after sunrise). This rotation negated any influence of position on trap performance. Originally, 11 traps were going to be tested. However, after two nights of operation, the Mosquito Magnet ‘Liberty’ ceased to function and had to be removed from the study. The traps tested here employ a range of attractants for mosquitoes. These are summarized in Table 1. Wind was primarily from the south and east for the duration of the study while relative humidity was generally greater than 70% overnight. The replication employed in this study should have negated any positional effects created by the weather. A total of 36,786 female mosquitoes were captured by the traps used in this study (Table 2). The Mega-Catch™ Premier (1343 per night) and Mega-Catch™ 'Alpha' prototype (752 per night) were the two best traps, followed by the Mosquito Magnet Defender (471 per night) (Figure 2). The remaining traps all captured mosquitoes, with means ranging from six to 215 mosquitoes per night. Figure 2. Graph showing average female mosquitoes caught by each trap per night (± SEM). The traps are ordered in descending performance from left to right. The orange lines indicate groups of traps whose performance cannot be distinguished using statistical tests (as determined by ANOVA and Tukey’s post hoc testing). For the purposes of comparison, we grouped the mosquito species captured during the study into the following categories: total Anopheles, total Culex, total Ochlerotatus vigilax and the total of other species. These categories serve to divide up the most important mosquitoes according to their ecological requirements and disease-carrying abilities. These are described in Table 3. The proportion of each mosquito category captured by each trap was calculated (Figure 4). These graphs show that a great deal of variation exists between the traps with regards to the type of mosquitoes they collect most often. Of particular note are the differences in the species catch of the Mosquito Magnet ‘Defender’ when compared to the Mega-Catch™ traps. The ‘Defender’ catches proportionally fewer Oc. vigilax and Culex. Other features of this data include the relatively high proportion of Anopheles captured by the Flowtron. Also of interest is the relatively high proportion of Culex captured by the three traps that use sticky paper (Mosquito Deleto, Sonic Web and Lentek Ecotrap). Comparing the mean catch for the ten traps permits an evaluation of their effectiveness. However, to determine whether the differences seen in Figures 2 and 3 are valid, we have employed an Analysis of Variance test (ANOVA). Put simply, this test estimates the chances that the differences seen in Figures 2 & 3 are actually real, and not simply due to chance. In general, if the probability that the differences shown in Figures 2 & 3 are due to chance or fluke is 5% or less, we consider that the differences between the traps are most likely real. Table 4. Results of statistical tests on data for the 10 traps compared here. The ANOVA test has revealed that significant differences exist between the traps in terms of performance. Further testing (using a Tukey’s post hoc test) revealed exactly which traps have performed differently from each other. These groupings are indicated by the orange lines in Figure 2. Traps that share an orange line do not have significantly different performance from each other. Based on this analysis (Figure 2), it can be seen that the Mega-Catch™ ‘Premier’, Mega-Catch™ 'Alpha' prototype and the Mosquito Magnet ‘Defender’ are grouped together in terms of performance. However, the Mega-Catch™ ‘Premier’ has significantly better performance than seven other traps. The Mega-Catch™ ‘Premier’ not only caught the most mosquitoes of the traps discussed here, but also did so without the use of carbon-dioxide as an attractant. This trap consistently out-performed six other traps that released carbon-dioxide. Such mosquito-catching properties are rare in a trap that does not use carbon-dioxide. Most of the traps tested here are marketed as devices that will reduce the number of mosquitoes biting humans in domestic situations. Although no traps were specifically assessed for this property during this study, it is probable that some of the poorer performing devices (as reported here) would provide little benefit to consumers in this regard.